Prince Harry Fighting With Prince William Over Interference With Meghan Markle Relationship? Prince Harry was left quite upset when his brother Prince William tried to give him advice about his relationship with Meghan Markle back in 2017. As a matter of fact, there’s a new report that says Prince William tried to warn his brother that he was supposedly moving too fast with the Hollywood actress but Harry didn’t want to hear anything about it. According to a new TLC documentary called Kate vs. Meghan: Princesses at War, a royal insider says that the reason why Harry and William have drifted apart these last several months is because of Harry’s wife, Meghan Markle. British best-selling author Katie Nicholl said that when Prince Harry and Meghan Markle announced their engagement back in November of 2017, William not only grew increasingly worried about his brother, but he also tried to give him a warning, too. That didn’t sit well with Harry, who took it as an insult. Reports say that Harry is fiercely protective of his wife and he interpreted William’s advice as criticism. What’s more, many people in Harry’s inner circle have noted that he has significantly changed ever since he married the former Suits star. That’s because he is apparently “completely beguiled and enthralled” by his wife, who has managed to become both a tabloid magazine and gossip blog star on both sides of the pond. Before Meghan came into the picture, Harry spent a considerable amount of time with Prince William and his wife Kate Middleton. Unfortunately, that isn’t the case anymore. So far, Buckingham Palace has had no comment on Prince Harry and Prince William’s supposed rift. With that being said though, many royal observers couldn’t help but notice that the royal brothers were anything but friendly the last time they were seen in public together. 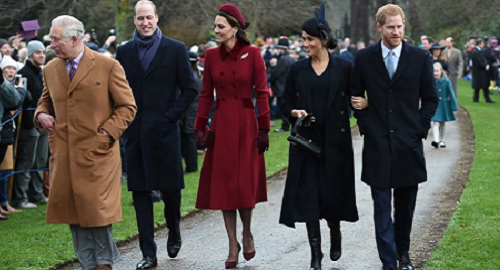 While their wives Kate and Meghan put in an effort to try and look friendly with one another on Christmas Day, Harry and William were not only seen keeping their distance from each other, but also kept rather quiet, too. In the meantime, don’t forget to check back with CDL for all the latest news and updates on Prince Harry, Meghan Markle and the rest of the royal family right here.